Multifunction digital moveable charger. Using the efficient boost converter and battery protective IC. It's built-in intelligent identification chips are able to identify different king of digital products the voltage & electric current. 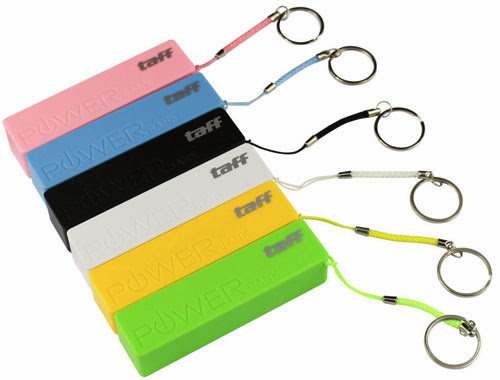 Power bank Key Chain is a new innovation of power bank that designed justÂ like a key. It easy to carry, has a smart apperance and colourful, and easy to use. It has multiple circuit protection system, can avoid overcharge, over discharging, short circuit, etc. Fashional design, nice appearance, elegant , colorful, easy to carry and use, it is popular in young and old. It will be able to fully charge your smart phone many times. All our products would be strictly tested before they deliver. Power efficiency > 90% ,more energy-efficient and environmentally friendly. Can work with many kinds of electronic products intelligently, as cellphone, ipad ,Mp3, Mp4, etc.